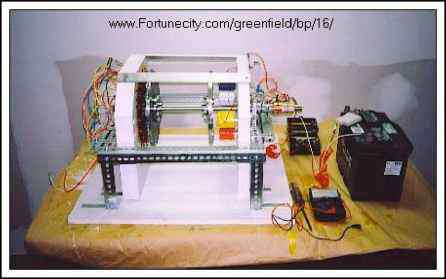 A permanent magnet, pulsed DC electromagnet motorgenerator for the production of electric power. The source or input for the electric power is the magnetic flux of neodymium permanent magnets. The device consists of a motor, a generator, commutation and a circuit. The motor consists of permanent magnets fixed to a rotor. The stator employs pulsed DC electromagnets. The permanent magnets and the electromagnets are arranged around the rotor and stator opposing each other. As the permanent magnet rotor rotates, the permanent magnets are attracted to the iron core of the electromagnets. When the permanent magnets are slightly passed the center of the electromagnets, a short duration pulse of DC power is supplied to the electromagnets. This causes the permanent magnets to be repelled by the like polarity magnetic flux of the electromagnets. As the rotor rotates the attraction and repulsion of the permanent magnets and electromagnets provide torque to a common axel shared with the generator and commutator. When the primary pulse to the electromagnet ends, the magnetic field developed around the electromagnet coils collapses. This collasping electromagnetic field provides a voltage that can be employed to recharge a secondary battery on the motor side. The generator consists of a rotor with multiple permanent magnets arranged around the perimeter. The magnets are assembled in alternating polarity. The stator consists of an iron wire core imbedded in an insulated material with magnet wire coils assembled opposite the permanent magnet rotor assembly. As the rotor rotates the magnetic flux of the permanent magnets induce a voltage and current in the copper coils. The alternating current output of the permanent magnet , copper coil assembly is rectified to a direct current by means of a full wave bridge. The direct current is then employed to charge a battery bank. A commutator is attached to the common axel to provide the direct current pulse to the electromagnets of the motor stator at the optimum time for the optimum duration. A circuit provides the means of delivering power to the commutator from the primary battery. A new circuit design is being developed to employ the back EMF from the electromagnet coils to recharge the motor's batteries. The permanent magnet / pulsed dc electromagnet motor - generator produces electric power from the magnetic flux of powerful neodymium magnets. The PM/PEM,M-G motor consist of two opposing disk, a rotor and a stator. The rotor is connected to a shaft [ axel ] by means of a flange. The shaft is mounted to a frame through two bearings that allow the shaft to rotate while mounted on the frame, one on each side. Attached to the rotor are permanent magnets arranged equidistant around the perimeter of the rotor facing the stator. The stator is fixed in position next to the rotor but independent of the shaft. The shaft runs through a larger diameter hole centered on the stator. Mounted on the stator are electromagnets that are arranged directly opposite the permanent magnets of the rotor. As the rotor rotates, the permanent magnets come into alignment with the electromagnets. During this phase the permanent magnets are attracted to the iron, steel core of the electromagnets. Torque is provided to the shaft by the magnetic attraction of the permanent magnet and the iron, steel core. No power is consumed. This is the Attraction Phase of the Power Cycle. As the permanent magnet rotates past the center of the electromagnet, a power pulse is fired through the electromagnet. The like polarity of the electromagnet and the permanent magnet cause the permanent magnet to be repelled. Torque is provided to the shaft by means of the magnetic flux of the permanent magnet and the magnetic field generated by the electromagnet. Power is consumed for only a brief [ milli-seconds ] period of time. The power pulse is delivered at the optimum time for the optimum duration by a commutator. This is the repulsion phase of the power cycle. Most of the work, power delivered to the shaft in the form of torque, is done by the permanent magnets. Because power is consumed for only a brief period of time upon each alignment of the permanent magnet and electromagnet, very little power is necessary to run the motor - generator making it highly efficient. Pick up coils wound around the electromagnet can utilize the collapsing magnetic field [ back EMF ] of the power pulse to generate a current that can be employed to recharge secondary batteries. A DC generator is connected to the shaft of the permanent magnet / pulsed dc electromagnet motor. The generator is actually an alternator with the alternating current rectified to provide direct current for charging a battery bank. The principle of operation of the alternator is the permanent magnets on the rotor provide magnetic flux which induces a current in the copper coils. The copper coils are arranged on a solid steel wire core. This reduces the resistance to the rotation of the permanent magnet rotor normally caused by the interaction of the permanent magnets and iron core of the electromagnets. How to connect dc alternator with battery? How to make permanent magnet free energy generator ? What is the purpose of capacitors in a diy magnetic generator? How to build electromagnet rotor for wind turbine? 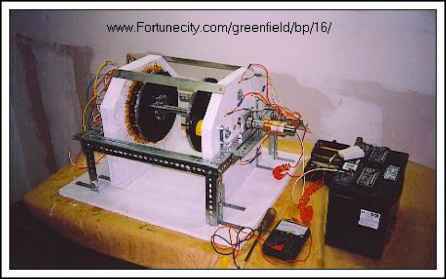 How to build a magnetic generator free plans? 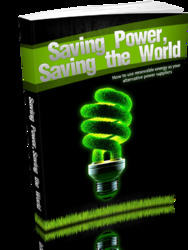 How to generate free electricity using permanent magnet? How to build free electricity from permanent magnet? How to make a generator with speaker magnets? How to make free electricity with magnetic power generator? How to make a generator with magnets and copper wire? How to build a pulse generator electromagnets? How to make a ganarator at rotor abstract? How to make a ganartor at home in rotor energy abstract? 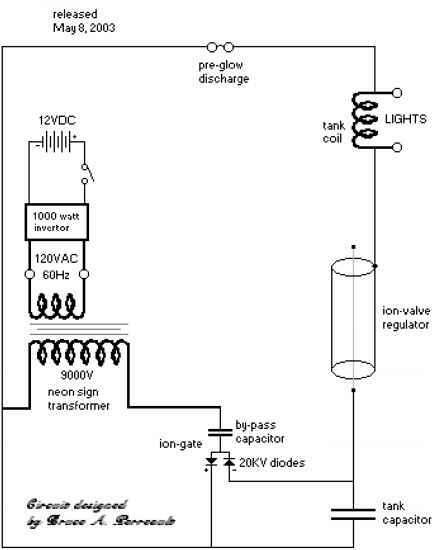 How to make free energy generator project abstract? How To Build Pulsed static Magnetic Free Energy Generator? How to generate electricity at home with magnets and copper? How to build a homemade magnetic generator? How to build free energy magnet motor?